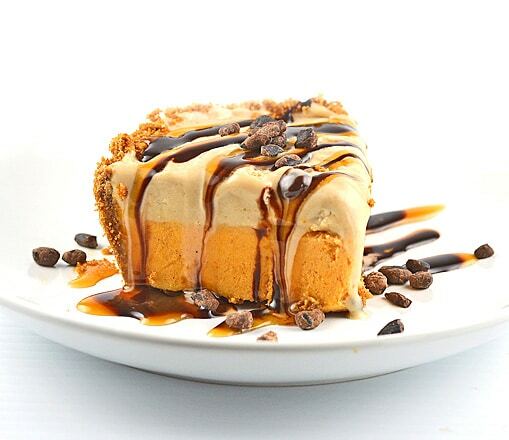 This Frozen Pumpkin Pie was created using the So Delicious Dairy Free® brand Coconut Vanilla Bean and Cashew Salted Caramel Cluster Frozen Dessert (my personal addiction). If you’ve followed me for awhile now, you already know my love for this company. I’m a huge fan of the entire range of products they offer. The first step in creating this mouth-watering dessert is to prepare the gingerbread crust. Many brands of gingerbread cookies are “accidentally” vegan meaning they don’t generally contain eggs or milk products. Just check the label before you buy. I crush the cookies in a food processor, add brown sugar, a small amount of all-purpose flour, a pinch of salt and to hold it all together, melted vegan margarine. You could also use coconut oil here. Press the mixture into a pie plate and bake for about 10 minutes. Remove to a wire rack to cool completely. (You could also opt to purchase a pre-made graham cracker crust if you prefer). 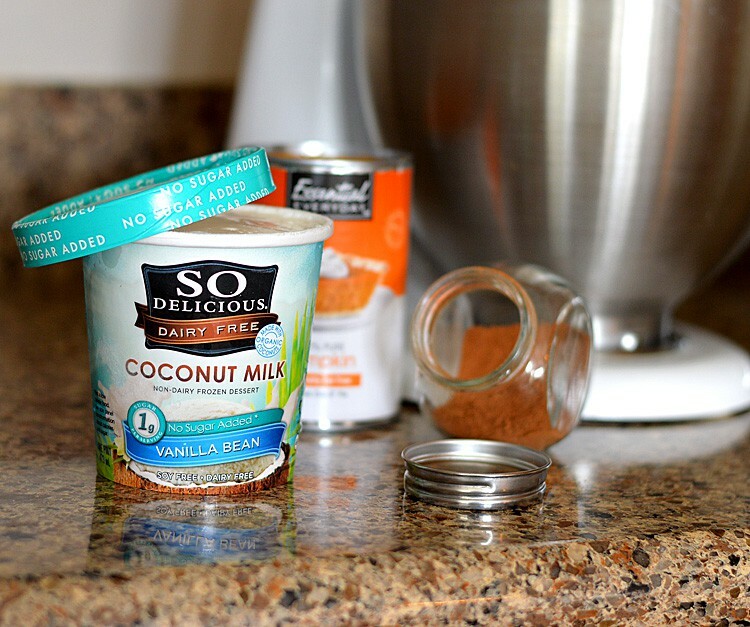 Meanwhile, it’s time to turn that Coconut Vanilla Bean into pumpkin! It is as simple as softening the Coconut Vanilla Bean until you can manipulate it easily with a spoon. We’ll add pure pumpkin puree and pumpkin pie spice. Combine well and return to the freezer for at least 30 minutes. If you don’t have pumpkin pie spice on hand, don’t worry…I’ve got you covered! Just click here for a recipe using ingredients you likely already have in your cupboard. Now you’ll want to prepare a vegan caramel sauce if making a homemade version (plenty of recipes on the Web) and soften the Cashew Caramel Cluster. 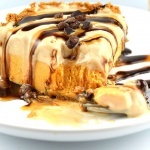 I’ll also get the pumpkin frozen dessert softening at this time. You want them spreadable and soft, but not melted. Once you complete the layers, put back into the freezer for at least an hour to firm up and then it’s ready to slice! Run a sharp knife under very hot water and wipe clean in between slicing. This makes your job A LOT simpler. 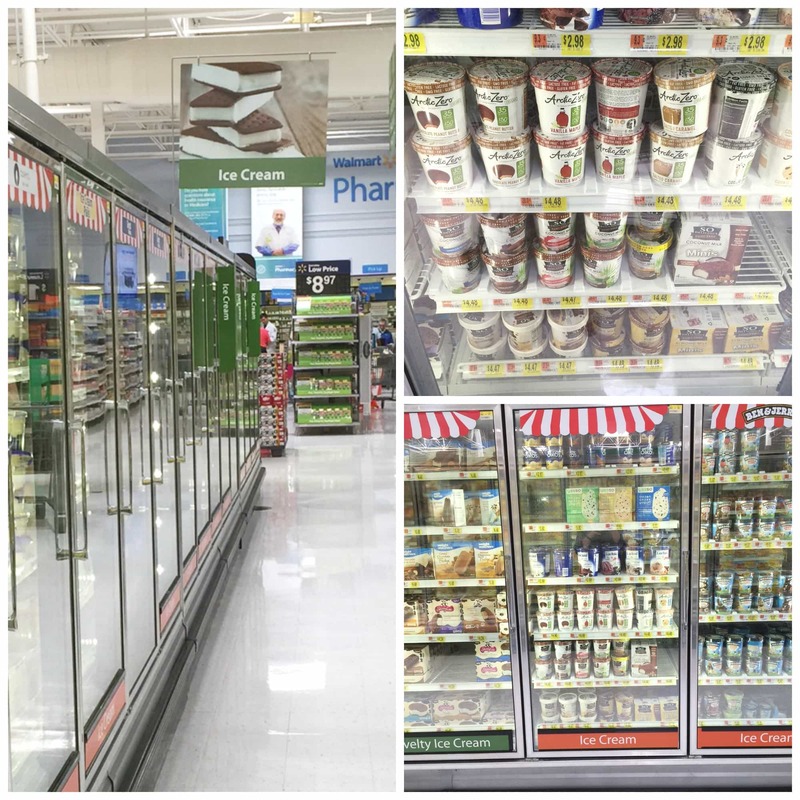 I found the So Delicious Dairy Free® Frozen Desserts in the frozen dessert aisle at my local Scottsdale, AZ Walmart. Some of these flavors are available at specialty grocers, but how great is it that these vegan treats are now becoming so easily accessible in a store as mainstream as Walmart? Yay. Progress! Taste is, of course, the main reason I love the SO Delicious Dairy Free® brand, but did you know that not only are they completely vegan, but also Non-GMO Project Verified. They are cholesterol-free, contain no artificial colors, flavors or preservatives, no high-fructose corn syrup and are certified kosher. Definitely products you can feel good about eating. To learn more about SO Delicious Dairy Free®, please visit their website or any of their social media pages: … Instagram, Facebook or Twitter. 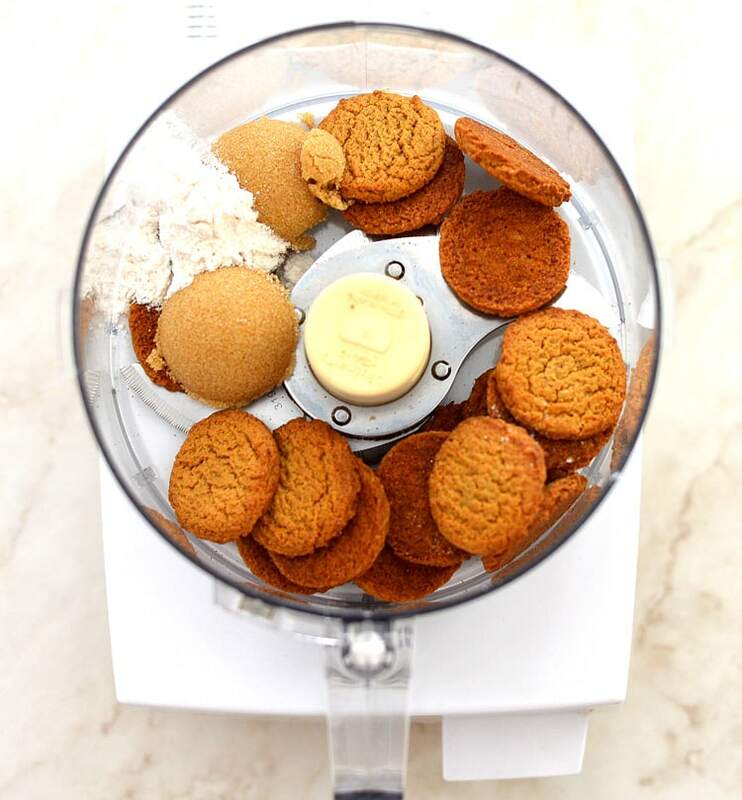 In the bowl of a food processor, crush the gingerbread cookies to measure 1 C.
Then add the brown sugar, flour, salt and melted vegan margarine. Press into the bottom and sides of a pie plate. For a larger pie, double this recipe. Bake at 350 degrees for 10 minutes and remove to a wire rack to cool completely. Meanwhile, soften the Coconut Vanilla Bean and mix the pumpkin puree and pumpkin pie spice into it. Return the the freezer. When the crust is nearly cool, remove the pumpkin from the freezer and allow to soften. You want it to be spreadable, but not melted. 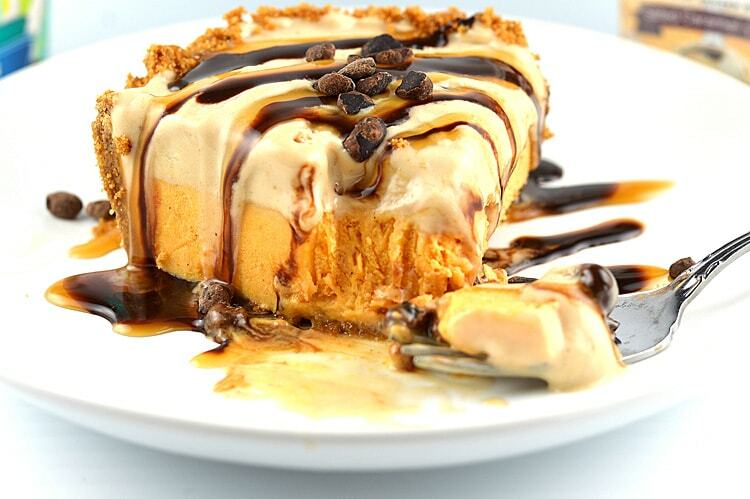 Spread the pumpkin frozen dessert onto the crust, forming an even layer. Return to the freezer. Remove the Cashew Salted Caramel Cluster from the freezer to thaw while this is happening. Again, you want soft, not melted. Spread the Cashew frozen dessert onto the pumpkin layer and return to the freezer for at least 1 hour or until firm. Using a sharp knife run under hot water and wiped dry, slice the pie. Top with vegan chocolate sauce, caramel sauce and/or cacao nibs just prior to serving. That looks delicious! Great treat for this time of year. I had no idea that gingerbread cookies are often vegan! That’s great to know, as we recently discovered my daughter has a milk allergy. Thank you for the tip!